The past week in Uganda has really put things in perspective for me. It is easy to take the simple things in life for granted and it is only once you are on-the-ground in a country like Uganda that you realise just how lucky we have it. In Uganda we have seen firsthand the challenges that families face to be able to put food on the table, access a clean source of water and provide their children with the education needed to further their lives. However, nothing has put things more in perspective and confronted and challenged me personally than our visit to the Missionaries of the Poor today. 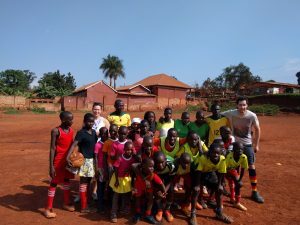 The women’s missionary, located in the slums of Kampala, provides a home for orphans and disabled people that others can’t or won’t care for in an unforgiving society. We were given a tour of the home by Brother Gabriel, one of seven Brothers in the Missionary, and introduced to the young and old women who battle so courageously with disability. 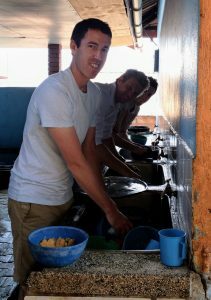 I have no doubt that the Brothers in the Missionary are the most kind-hearted and caring people that I have ever met. They have dedicated their lives to serving the most vulnerable people in society and do it with a smile. They were very generous with their time and I can only hope that the Kain Foundation’s donations and our time spent with the kids is of some help. What really hit me was hearing the story of a young girl from the Democratic Republic of Congo. She had witnessed her mum and dad being shot and killed by a rebel group and was left with a serious disability when her family tried to escape the war torn country. It’s hard to even imagine the pain that she has to go through on a daily basis and you can only be thankful that she is now in a safe place at the Missionary. It is hard not to leave the Missionary as a changed person and I wish that I could have done more. In the afternoon, we visited Kids for Africa founded by Asimwe Marvin a young Ugandan man who, at the age of 24, has created a platform for educating children through sport. It was obvious that the kids saw Asimwe as a role model and it was amazing to hear how Kids for Africa has provided disadvantaged kids with an enthusiasm for life-long learning and achieving their dreams. The final chapter of the day involved the prestigious Kain Cup. 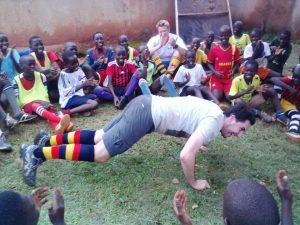 The Uganda “trippers” were divided into different teams and partnered with students. Unfortunately my famous Lions team lost the final in a penalty shootout which meant that Michael “Gazman” Garry’s team of Rhinos were victorious. It is unknown whether match fixing was involved, however investigations have begun. We approach Gaz for a response; he declined to comment, however, we understand that preparations for a defamation suit have begun. 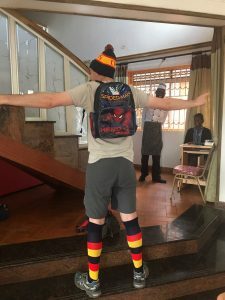 One week in and the Uganda trip has already been everything that I could of asked for and more. It is definitely the trip of a lifetime and I can’t wait to see what is planned for the coming days.